Did you know that a few rocks, some sticks, a shoelace or two, a wrist watch, a dollar bill, and a drinking straw are all you need to make surprisingly accurate sun-powered and star-powered gizmos? 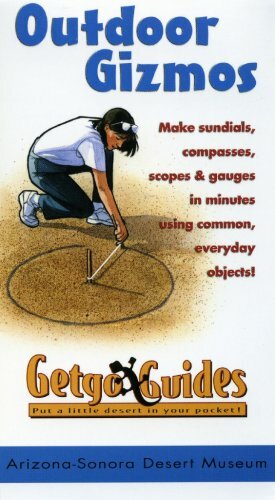 It's a fact: In minutes you can construct a stick and rock sundial or compass, assemble a Sky-high Scope (included) that can measure the height of a tree or determine where you are on the planet, or figure out how long until the sun sets using nothing more than your hands. This handy guide is intended for just about anybody who plans on spending some time out in nature. Seasoned hikers and backpackers will want to add these gizmos to their bag of survival tricks. For everyone else, this Getgo Guide will provide great entertainment, and maybe even an entirely new way of connecting with the sun and stars. Venture forth! Make Gizmos! Have fun! Steve Phillips served as the Publications Manager through 2004 at the Arizona-Sonora Desert Museum and the author or editor of a number of books on natural history and historic architecture. Steve has always had a love for wild animals, wild places, the sun, the stars . . . and gizmos. His current gizmo projects include a solar tracking device (called an analemma) and a solstice/equinox "catcher." Both are made out of stuff he found around the house. He'd have it no other way.